I recently received this E-mail from our oldest son. He and his family are currently living in Ohio. Our grandson John is in Kindergarten and his younger brother, Andrew, is still at home with mom. Our son sent me this e-mail which inspired this post. Dad - The kids have a 'How Things Work' book that they often ask to have read before bed. One of the sections is on a coal power plant. I explain the whole process from coal in the furnace to turning on the light in the bedroom. One of the stages is the turbine/electro-magnet. Ann heard me read it to the boys today and mentioned that John was downstairs with a refrigerator magnet wrapped in a telephone recharger wire...spinning it to see if he could make electricity. Do you have any cool creations on electro-magnets? Obviously, John would like to build an electric generator. But before helping him and his dad make a generator, I sent the boys a couple of electromagnets made using a nail, insulated wire, masking tape, a rubber band, and a D-size battery for them to play with. 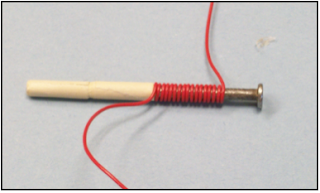 It’s easy to wrap an electromagnet. To make one, have the kids or grand kids follow these steps. • Wrap the pointed end of the nail with a four-inch strip of masking tape. This covers the sharp end of the nail. Next to the taped end, wrap a second four-inch strip to provide a barrier that will hold the wire in tight coils. 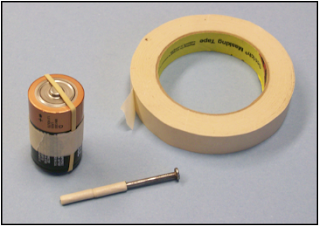 Stretch the rubber band around the battery and wrap a strip of masking tape around the battery to keep the band from slipping off and to hold the band snug against the ends of the battery . 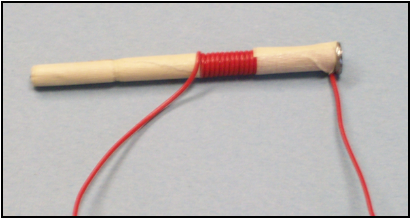 • Beginning at the masking tape, leaving 6-inches of wire at one end, start wrapping the wire in tight coils around the nail. Shove the coils together with your fingers. Wrap coils to the head end of the nail. • Wrap masking tape around the first layer to hold the coils in place. • Wrap the wire in the opposite direction being careful to keep the coils together. Wrap to the end of the masking tape covering the first layer of coils. • Wrap masking tape around the second layer of coils to hold them in place. The electromagnet is ready for testing. Make a pile of paper clips or some other metal objects. Slide the bare end of each wire under the rubber band at the positive and negative ends of the battery. Press the ends of the battery with thumb and forefinger, put the head end of the nail in the pile of paper clips, and lift up as many clips as possible. When connected to the battery, the electromagnet can get hot. If they feel the electromagnet getting hot, tell the kids to drop the battery immediately and to pull the ends of the wires from the under the rubber band. With a working electromagnet, kids can explore which materials are attracted to the electromagnet and which are not. Encourage the kids to classify the materials. Challenge the kids to find a metal that is not attracted to the electromagnet. 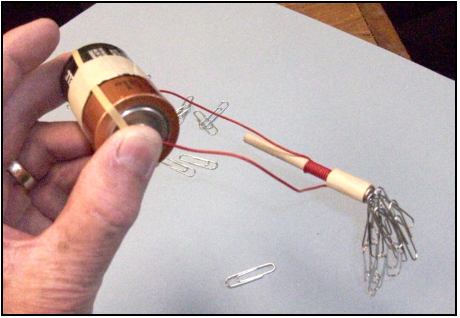 The electromagnet demonstrates to kids that electricity and magnetism are connected concepts. In 1820, Hans Oersted discovered that a compass needle moved when placed near a wire carrying electricity. Compass needles detect magnetic fields. Oersted's discovery led to the electric motor. Soon after, Michael Faraday discovered that moving a magnet near a wire creates an electrical current in the wire. Faraday's discovery is the key to the electrical generator. What was in John’s mind, what was he expecting to observe when he wrapped wire around the refrigerator magnet? None of us know. But we can help our kids by making sure we know what they are curious about and then provide the materials they need to expand their knowledge of the physical world. A generator is harder to make than an electric motor. Next, I will send the boys a simple homopolar motor. It has a magnet, a coil of wire, and a battery. When assembled, the coil spins rapidly. The motor should show John how close he was to getting that refrigerator magnet to spin. 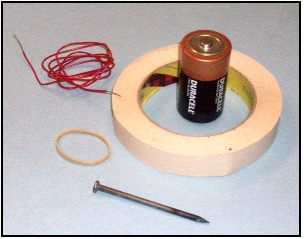 I will describe how to make the homopolar motor in a later post. I love you. Great post. I'll have to try this with Malachi. My tendency would be to let Kurtis do this with him, but I think I'd like to have fun learning this stuff! :) I'll be keeping an eye out for the homopolar motor.